Anne of Green Gables at 100. Anne of Green Gables grows old and gets her due. One hundred years ago, L.M. Montgomery did for women’s imaginative lives what Susan B. Anthony did for women’s political lives by publishing Anne of Green Gables, the story of an outspoken red-haired orphan growing up on Canada’s Prince Edward Island. The book immediately broke through commercially and artistically, selling some 19,000 copies in five months, leading even the cranky dean of American letters, Mark Twain, to pronounce Anne “the dearest and most lovable child in fiction since the immortal Alice.” Today, Anne of Green Gables and its seven sequels are the basis for a small industry. More than 50 million editions of the first volume are in print around the world. The books have spun off movies, musicals, miniseries, and an assortment of bric-a-brac, from tea sets to light switches. But perhaps the greatest tribute to Anne’s enduring vitality is the decision by the solemn eminences who edit the Modern Library to issue and heavily promote a centennial edition of the first volume in the series. Tolstoy and Anna Karenina, meet L.M. Montgomery and Anne Shirley. To some, this canonical promotion of a writer who would probably now be classified as a Y.A. (young adult) author might seem preposterous. To certain left-leaning cultural theorists who won’t embrace a heroine with a less-than-revolutionary CV—Anne, once the Island’s best young scholar, chooses to become a devoted wife and mother of six—the Modern Library’s decision may appear to be a reactionary cave-in to nostalgic sentimentality. All very plausible arguments. But none of them is capable of accounting for Anne’s still-flourishing appeal and the series’ intellectual hold on the women who read it as young girls. Revisit Anne of GreenGables with an open mind, no matter what your age, and there’s an excellent chance you’ll feel that Anne deserves, however belatedly, to dwell in the company of Huck and Tom. Anne Shirley is not a stereotypical girl heroine of her period. At the age of 11, she’s adopted by Matthew and Marilla Cuthbert, a pragmatic bachelor and spinster who have sent for a boy to help them out with their farm. Because of a miscommunication, the Cuthberts instead get Anne, a lonely, talkative girl who sees the world through starry eyes despite the hardships she’s experienced as a foster child. But Anne is hardly a perfect child. Impetuous, proud, and perpetually distracted by her daydreams, she’s always “getting into scrapes.” (“It’s so easy to be wicked without knowing it, isn’t it?” she asks Matthew on their first meeting.) She forgets to hang up her clothes; she fails to make tea when Marilla asks her; she calls Mrs. Rachel Lynde, the town gossip, “a rude, impolite, unfeeling woman” who hasn’t “a spark of imagination”; and she accidentally intoxicates her best friend with currant wine. At school, she breaks a slate over the head of Gilbert Blythe, a rival student who teasingly calls her “carrots.” Her temper and her gaffes provide fodder for those village members who dislike having a child of “uncertain parentage” around. Yet with time, Anne wins nearly everyone over, as her grace, curiosity, and haplessness catalyze the bloodless community. She enables adults to reconnect with the childish soul within. None of these charming qualities would seem to qualify Anne for hero status among contemporary women. What does is her habit of radical alertness. Nearly always, imagination comes first for Anne: before social expectations, before conventional romantic customs, and even before her gender’s storied instinct to please and reassure. Because she is starved for human love, her primary attachment is to the natural world. As she approaches Green Gables for the first time with Matthew, she excitedly renames the landscape around her, dubbing a neighbor’s pond “The Lake of Shining Waters” and transforming a prosaic “avenue” into “The White Way of Delight.” In doing so, she reclaims the great, definitive Adamic prerogative: to name the world. Just as fresh and exacting is Montgomery’s understanding of the connection children feel to the subtleties of the natural world. Nature, as Montgomery portrays it, enables children to experience autonomy and mystery as they can nowhere else. Each nook of shadows in a sun-striated field holds the promise of esoteric knowledge: “Below the garden a green field lush with clover sloped down to the hollow where the brook ran and where scores of white birches grew, upspringing airily out of an undergrowth suggestive of delightful possibilities in ferns and mosses and woodsy things.” In Anne’s eyes, the woods and fields of Avonlea become a half-world of fantasy, fairy tales, and chivalric poetry, where ghosts roam the woods between her house and her friend Diana’s or where a flat can become Elaine’s tragic barge en route to Camelot. Indeed, Anne’s relationship to nature is almost pagan, steeped in the sensual. Anne, for her milieu, is one weird sister. Unlike many other children’s heroines—Jo of Little Women, Rebecca of Sunnybrook Farm, even Nancy Drew—Anne is not just a sensibility incarnate; she has an irreducible human soul. * Her inner spiritual life exists utterly apart from the domains of domesticity and romance. She may be capable of telling her best friend, Diana, “I’d rather be pretty than clever,” but she is also organically indifferent to the courtship tactics of the popular Gilbert, whose smooth brown eyes wholly disarm the other girls. The immunity of the questing self to the distracting temptations of the flesh is most often an attribute of heroic men, from the hardboiled detectives who pass up luscious blondes to Greek warriors who heed not the sirens. Anne, with her endless wealth of subjectivity, is nobody’s object but her own. And she takes the prerogatives of the questing self to be her own. She may enjoy male company—especially as she ages and befriends Gilbert—but the pursuit of it hardly deflects her emotional course. As if in reverence for Anne’s independence, Montgomery often shows her to the reader in hovering tracking shots. 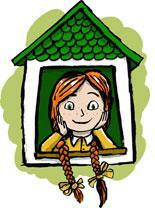 In Anne of the Island, the third volume, Montgomery has Anne looking out a window in one of her lofty moods. “In imagination she sailed over storied seas that wash the distant shining shores of ‘faery lands forlorn …’ And she was richer in those dreams than in realities; for things seen pass away, but the things that are unseen are eternal.” That last idea—that there’s no place like the imagination (sorry, Dorothy)—could be the series’ credo. (It’s also the opposite, it turns out, of L. Frank Baum’s more dismal message to Emerald City-infatuated young girls, who are forced to admit that reality consists of a dusty Kansas homestead.) It’s unusual for a book about a girl to champion fantasy over the facts of life, such as they were ordinarily defined. This doesn’t make Anne an ethereal sprite herself, though. Later in the series, she does grow up. She goes to college, develops her writing, marries Gilbert (but only after he almost dies, and out of abiding friendship, not fear of loneliness), and becomes the mother of six children. Still, the result is a sort of blended family. Her physical offspring have to share the house with her fertile imagination. But what this argument misses is the inherently progressive nature of Anne’s indomitable alertness, whose power is hardly diminished by the fact that she trains it on her children and the world rather than the blank page. She continues to meet, with her full self, mundane contingencies and tragic losses. If this isn’t an overtly political stance, it’s capable, if properly contemplated, of inspiring one.